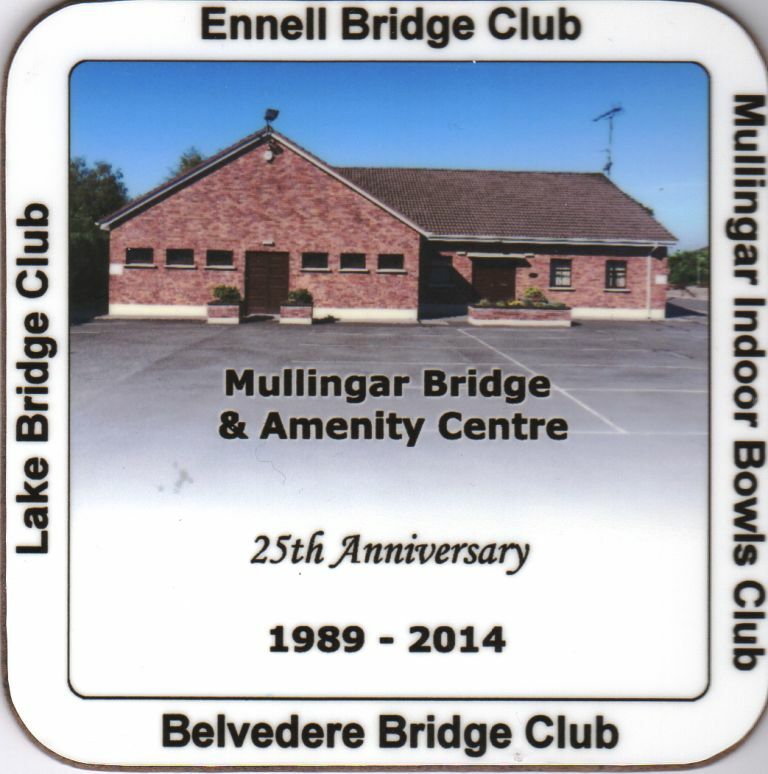 In the early 1970’s there were three Bridge Clubs in the Mullingar area. The longest established was the Golf Club Bridge Club followed by the Lake and Belvedere Bridge Clubs. In 1990 a new club, the Ennell, was formed to cater for the new players from the Bridge classes run by John Cunningham. While the local hotels gave good support to the clubs there were problems with availability, particularly at Christmas and other holiday times. In May 1987 a meeting of the Belvedere Club was convened to consider the possibility of establishing a dedicated Bridge Centre. It was decided that such a venture was too great for any one club and a committee with Jim Hearn as Chair was tasked with progressing the project and by end of 1988 a fund of £42,000 had been raised. There was great interest and support from all sections of the community and over 300 bonds were purchased which serviced a major portion of the £95,000 required for the Centre. The foundation stone was laid on July 1st and the Centre was officially opened on December 8th 1989. Shay Callaghan, Deputy Chair of Westmeath County Council, cut the tape assisted by Mrs. Kay Downes, President of the Contract Bridge Association of Ireland; Fr. Moore, Administrator Mullingar Parish; Jim Hearn and John Cunningham of the Centre committee. The Centre is now home to three Bridge Clubs and Mullingar Indoor Bowls Club. Membership is open in all Clubs. Bridge classes are held at regular intervals and all levels from Novice to Master are catered for by the various clubs. A relaxing and entertaining night and can be enjoyed in pleasant surroundings for €5 and you also have the opportunity to win a prize on the night. The founding committee were, Jim Hearn, Seamus Hunt, Mattie Forde, Pat Medforth, Joe Maguire, Murty Hanly, Patsy Sheridan, Michael Hynes, John Cunningham, Tom Kinirons, John Coghlan, Sean Galligan, Michael McDonagh, Pat Lynam, Jim McAuliffe, Annie Hanlon, Bridie Morris, Mabel Barrett, Molly Hunt, Kay Murphy, Lily Hynes, Ursula Hearn, Kathleen O’Hara, Susan Tuite, Peg Kelly and Carmel Maher. When Chairman Mary asked me to give a short history of the Mullingar Bridge and Amenity Centre I said “sure everyone knows that” and Mary said I for one don’t as it was much later than 1989 when I learned anything about the game of Bridge and/or the The Bridge Centre. She was right of course because even though our membership age profile is not that young, on looking back on the membership list of the eighties it is clear that there has been a huge turnover in membership. Some have given up the game, some have moved to other towns and other clubs and sadly a very large number of members have gone to their eternal reward. In order to tell the story of the Bridge Centre one would have to understand a little about the History of Bridge in Mullingar. For a lot of what I am about to relate I am indebted to the late Dr. Michael Flynn whose History of Bridge in Mullingar as published in the Westmeath Examiner in 1995, and is displayed outside on the Bar wall. 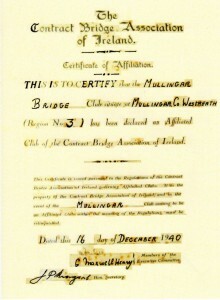 Bridge was played in numerous places in Mullingar including the Courthouse, the Midland Hotel in Mount Street, The Shaw Murray Restaurant currently Heatons, and The Golf Club right through from 1930’s to 1966. I pick 1966 because that was the year that The Lake Bridge Club came into existence. The Lake Club played initially in the Lake County Hotel, Broder’s Hotel and latterly in the Greville Arms Hotel. In 1983 the Belvedere Club was founded and was looked on as a starter club for those who finished Bridge classes under John Cunningham it operated initially from The Bloomfield House Hotel then from Tappers which was the new name for Broders currently known as The Newbury. In the mid nineteen eighties the only one of the three Bridge Clubs in Mullingar that had their own premises was the Golf Club Bridge Club where then as now Bridge was played on Monday nights from October to May. Both the Belvedere and the Lake clubs held their competitions in various Hotels around the town and were subject to cancellation at short notice if the Hotel had another more rewarding event. In addition some of the premises were then not very accessible for wheelchair bound or elderly members. In 1987 a number of Bridge players came together to investigate the possibility of purchasing, long term renting or building their own premises so that the two clubs could have a shared facility. Research was undertaken into how Bridge Centres in Galway, Greystones and Clonmel had been developed and the costs associated with their development. The mid to late eighties was not a good time to start fundraising for any sports facility in Mullingar for one thing the recession of the early eighties was as bad as the current recession and for another a major Sports Centre beside Cusack Park had raised a lot of money but was only partially built and had come to a halt. There was little appetite for taking risks or investing in projects at that time. Undeterred a Committee was formed with Jim Hearn as Chairman, Michael McDonagh as Vice Chairman, John Cunningham as Secretary and Kay Murphy as Treasurer on the 23rd of October 1987 with a view to providing a Bridge Centre comparable with other county towns such as Limerick, Galway, Ennis and Wexford. After examining various options it was decided to start with a view to building or acquiring a suitable premises. A private members draw was organised with tickets £10 per month for six months or a single payment of £50. Ticket sellers were incentivised by the provision of a free ticket for every fifteen tickets sold and paid for plus prizes for the seller of the most tickets. The winner for the sales of most tickets was as I recall the late Annie Hanlon. The first prizes in the monthly raffle were cars for 3 of the months and cash prizes of £3,000 for the other 3months. The Bonds were the next major fundraiser idea whereby members purchased bonds at £100 each on which they got £5 interest per annum and they were guaranteed the bond would be redeemed at par within 20 years. 5% of bonds to be redeemed each year. This raised about £33,000, so that by mid1989 there was a war chest of approximately £77,000 to purchase a site and build a Centre. Mr Jim Hearn Chairman of the Centre Committee negotiated the purchase of the site from Westmeath County Council for a sum of £8,000 of which £5,000 was deferred payment over three years. A design was agreed. Plans were drawn up by Richard McCabe. Planning permission was obtained, tenders sought and contractors Lynam and O’Boyle appointed. P. O. (Pat) Lynam R.I.P. was appointed Clerk of works so that by July 1st 1989 the foundation stone was laid by Senator Donie Cassidy Chairman of Westmeath County Council. The centre was designed to accommodate 160 bridge players made up of 25 tables in the large room and 15 tables in the small room. One has to remember that Bridge tables then were 2ft square and there were no Bidding Boxes or Bridge mates at that time. Speaking of the design a question I have often been asked down the years is “Why did ye put the flower beds just outside the front doors” It was done as a security feature to prevent the doors being rammed. On the 8th of December 1989 the Centre was officially blessed by Fr Paddy Moore and opened by Councillor Shay O’Callaghan Deputy Chairman Westmeath County Council with Ms Kay Downes President of the CBAI in attendance. Bridge Charity nights,Coffee Mornings and Table Quiz’s, Furniture Auctions etc. A system of Bar Team’s and Captains was put in place to manage the bar on a week by week basis, with a very strict protocol to control the costs and to maximise profit. These volunteers provided a great service to the centre for the initial period of time while the overdraft in the Bank of Ireland and the loan facility in the Credit Union were being paid down. Prior to 1989 the Lake Club used to organise the Mullingar Bridge Congress over the June Bank Holiday in the County Hall. For a number of years after the Bridge Centre opened this Congress was held in the Bridge Centre with the assistance of Teagasc next door with whom we have had a very good neighbourly relationship down through the years. This was a major operation that gave the new Centre much needed additional income for a number of years after it first opened. With the advent of the centre came the opportunity to develop other sources of entertainment hence the introduction of short mat bowls. This club started in 1990 with John Coghlan R.I.P. as the first President. It runs its own Bowls competition on Saturday and Sunday nights throughout the winter and has successfully competed in the East Meath League over the years. It is an excellent sport for the both the young and not so young and is a source of much appreciated revenue to the Centre. The opening of the Bridge Centre led to an upsurge in members learning Bridge and as the Belvedere Club had become more mature it was seen as necessary to have a new Beginners Club or Monday night Club as it was called initially, subsequently named the Ennell Bridge Club in 1990 under the Presidency of the late Jack Bray who died in office. The Ennell Bridge Club has looked after the needs of all those starting Bridge and some more mature players who prefer its ambience to other clubs over the years since. An Corn Cairidis– The Friendship Cup is a friendly international Bridge Competition which involves International Bridge Players, Bridge Officials, County, Club and Junior players and is played every two years between the English and Irish Unions. In February 1995 Mullingar Bridge Centre was selected as the venue. For the honour we had to host the two teams in various members homes provide hospitality as well as organise a fairly serious Bridge Competition. A highlight of the weekend was a Civic reception in the County Hall on the Sunday morning. The Chairman of the British Union who was due to speak at the reception was about to leave his hosts house when she noticed his shoes were less than pristine. The lady of the house said “ No one is going from my house to a Civic Reception in my County Hall with shoes like that” handing him a tin of polish and a polish brush. Peter Stocken Chairman of the English Bridge Union spoke very well at the reception although he looked a bit hungover (that’s another story) but his shoes sure looked well. Speaking of Peter Stocken he wrote a very nice account of his trip to Mullingar entitled “Everything to Play for Trevor” in the English Bridge Journal. There was a Banquet for both teams in the Bloomfield House Hotel attended by the then Minister of Tourism and Trade our current Taoiseach Enda Kenny. For the record Ireland won the match and the Mullingar players played extremely well. While the Chairmen and Committee members do a lot of the weekly hard graft in managing this enterprise and we will be honouring all our Chairpersons later we have been blessed with the three or four young part-time staff that look after us week in and week out. They are working away there today as usual. We are overseen by a group of five Trustees who keep us on the straight and narrow fiducially and ensure our good governance. Our original Trustees were Mr. Joe Barrett, Ms. Eva Foy, Dr Michal Flynn, Mr Charlie Kelly, and Mr Gerry Moore while our current trustees are Mr. John Cunningham, Mr. Jim Hearn, Mr. Charlie Kelly, Ms. Lena Shaw and Mr. Gerry Moore. Any potted history of the Bridge Centre would be incomplete without reference to our Pavilion Members or Social Members many of whom joined initially as Bridge or Bowls members but opted for the Pavilion status. These Pavilion members many of whom live locally have rendered great service to the Centre in many practical ways from key holders to security duties and Bar maintenance down through the years. The Centre would benefit from an increase in Pavilion Membership so if any of you know of any of friends or neighbours who would enjoy a quiet drink or a chat or a game of Bowls or even a social game of cards you might tell them the facility is here. One final bit of history the Centres logo with the Swans and the Four Card Suits Symbols was designed by the late founding member and local artist Tom Kinirons. Committees down the years have carried out a lot of renovations to the Centre from toilets to car parks, heating systems, bar systems and general décor. At the risk of leaving someone or some alteration out I have decided to keep mentioning names to a minimum. I hope no one takes offence as none is intended. Without the dedication of these people we would not be still enjoying the fruits of their labours twenty five years on. The Belvedere Bridge Club had a busy autumn with lots of competitions. The very popular Lough Lene Trophy sponsored by Tommy Fagan was held on September 9th. The winners were Peggy Tiernan & Mary McCormack. Also in September the High/Low teams of four competed for the Lough Owel Trophy. This was kindly sponsored by Martin Hynes and was won by Jim Prendergast, Paddy Grace, Teresa McGuire and Gabriel Murtagh. In October we had the Credit Union pairs, always a well-received competition. The winning pair was Susan Browne and Margaret Kilroy. Congrats to all prize-winners. In memory of Annie Hanlon a perpetual cup was presented by her family to Belvedere Bridge Club. Annie, who passed away in 2012, gave a lot of her time towards fund raising for the Club, in particular during its founding years. She was a master bridge player regularly playing 3/4 nights per week and won many local and national competitions. Annie was most welcoming and helpful with novice players. May she rest in peace. The highlight of the season was the celebration of 30 years since the foundation of Belvedere Bridge Club. The large number in attendance on the night were welcomed by our Chairperson Ann Seery, and then treated to a buffet meal with wine. It was most pleasing to have John and Marie Cunningham join us on the night. John was very pivotal in the founding of the Belvedere Bridge Club in the 1980’s. It all began in 1983 with John providing bridge lessons at various locations around Mullingar. As his bridge lessons became more popular and numbers increased John decided to form a new Bridge Club to cater for novice players. In 1984 John’s plans came to fruition with the forming of a Committee of Trustee’s which included John and others, namely Monica Harris, Nora McCormack, Mary Macken, Jim McAuliffe and Pat Lynam. The aforementioned formed a Committee and Belvedere Bridge Club was born, with the Club going from strength to strength over the years. The first President, Secretary and Treasurer were Seamus McAlister, Mary Macken and Nora McCormack, respectively. Jackie Reynolds, a long-time member of Belvedere Bridge Club gave a great account of the early days of the Club. He spoke with passion and pride regarding John’s achievements which included securing a permanent base to play bridge. Jackie recalled how the membership grew to well over 100 and recounted the difficulty encountered in finding rooms in local hotels willing to cater for the Club’s needs. Jackie gave credit toJohn, with support from his Committee and the Lake Club,for raising the funds necessary to secure a site for the construction of the Centre. Jackie thanked John most sincerely on his own behalf and on behalf of all present and rounded off his speech by wishing John & Marie longevity and good health for the future. Bridie Morris, also a long-time member of the Club, spoke of her gratitude to John thanking him for his patience and brilliance in his teaching of Bridge. Ann Seery was MC for the evening and made it into a wonderfully entertaining night. She regaled the crowd with memories o fpartnering John in various competitions and having difficulty in following his bidding pattern, but always enjoying the occasions nevertheless. Founding member Monica Harris who formerly partnered John on many a winning occasion presented him with a specially commissioned basket of Kilbeggan Whiskey. John graciously thanked everybody, especially Mary Gaye for making him an honorary life member of the Centre. The President and Members wish to express their deepest sympathies to Nancy Conroy on the death of her husband Denis who was a valued member of the Belvedere Bridge Club, and to all members who lost a family member during the year. May they rest in peace. Future competitions include the Presidents Prize over 2 nights on November 20th and 27th, and the Presidents dinner on December 4th.Full Club results will be posted at a later date. A WONDERFUL celebration of the 25th anniversary of the Mullingar Bridge and Amenity Bridge’s official opening took place on Sunday October 12. Founder members, former chairpersons, current members and invited guests gathered for a special day, which was blessed with fine weather. More than 160 guests were seated for a sumptuous meal as the festivities commenced. Excellent MC John Smyth was tasked with the demanding challenge of ensuring all ran smoothly and he performed his duties with aplomb. Current chairperson of the centre, Mary Gaye, extended the warmest of welcomes to all present including the Bishop of Meath, Most Rev Dr Michael Smith, and Rev Alistair Graham, Rector, All Saints, Mullingar, who performed a blessing for both the centre and all who use its facilities. Other guests included the Contract Bridge Association of Ireland national president, Fergal O’Boyle, and North Midland regional president, Ultan McCabe, both of whom extended their congratulations to all involved in the establishment of the centre in 1989.
bridge playing fraternity, to the founding members and the past chairpersons, some of whom, sadly, have gone to their eternal rest. The event was honoured by the presence of many of the founding members and by former chairpersons, each of whom was presented with a memento of the historic occasion. An engraved mirror, bearing the names of all the founding members was also unveiled by Mary. A beautiful anniversary cake was cut by Jim Hearn, first centre chairman and by current chairperson, Mary Gaye. The chairperson paid particular tribute who all who had assisted her in preparing for the celebration, particularly her fellow committee members, those who had helped to decorate the Centre and the excellent bar staff. A detailed history of bridge in Mullingar was delivered by incoming centre chairman, Murt Hanly, sharing the memories of the late Dr Michael P Flynn who penned articles for the Westmeath Examiner in the 1990s. He detailed the birth of the Lake Club, the Belvedere Club and more recently the Ennell Club, outlining their origins in venues such as Broder’s (now Newbury) Hotel, the Midlands Hotel on Mount Street, the Lake County Hotel on Pearse Street, both now closed and of course, the Greville Arms Hotel. The foresight of those who wished to find a suitable site for the marriage of all three clubs and allow for other use, was delved into and Murty, too; paid tribute to those who forged the development of the current Mullingar Bridge and Amenity Centre. As part of the great celebration presentations were also made, on behalf of the family of the late Annie Hanlon to Nora McCormack and Lily O’Donoghue, inaugural winners of the Annie Hanlon Memorial Cup and to Ken Ridsdale, winner of the special competition sponsored by the Bridge Centre for Mullingar Bowls Club, which is housed at the centre. The formalities completed, the fine evening was rounded off, as ever, with some competitive card playing and reflections on a wonderful facility and a fine and fitting celebration. Congratulations to Thomas Hanlon and Michael McDonagh who were elected as Honorary Life members of the Centre. The following message was received from Thomas Hanlon and I thank him for his permission to use here. Many thanks for your recent letter informing me that I have been elected Honorary Life member of Mullingar Bridge & Amenity centre. I am both delighted and honored to accept this privilege. Back in about 1981 when my mother, Annie, pushed me to attend John Cunningham’s bridge classes in the Bloomfield hotel I never dreamt where bridge would take me and play such a massive part of my life. I remember learning a lot from my early bridge partners, Pat Doyle, Claire Carter, Mary Shaw, Jim McAullife and of course especially my Mum and John Cunningham. Back in the early 80s we played in a variety of locations, the Bloomfield, the Newbury (cannot remember what it was named then), the Greville Arms and some other locations. How times have changed! Being a founding member and somewhat pushy fundraiser my Mum took incredible pride in the Bridge & Amenity centre and I know she will be even prouder with my election as Honorary Life member. Wherever in the world I am competing I never forget where it all started.